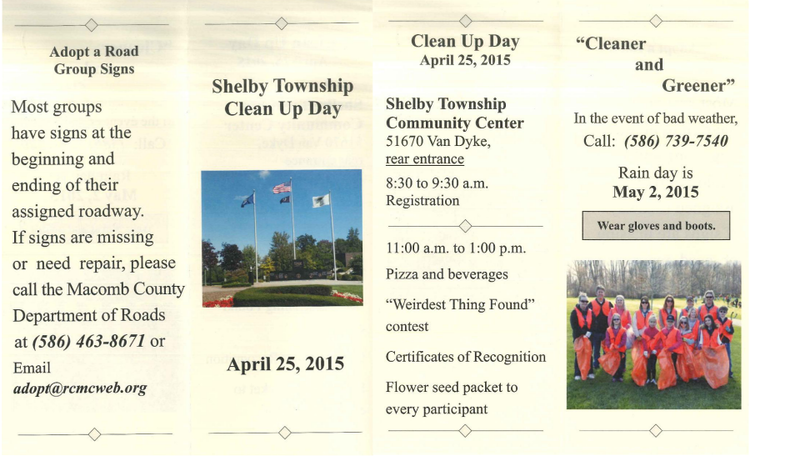 Help the Charter Township of Shelby spruce up for summer with its various spring cleaning events April 25. The Solid Waste and Recycling Committee and the Department of Public Works are hosting Hosuehold Hazardous Waste Collection with Rizzo Environmental Services for all Shelby Township single-family residential Rizzo Environmental Services customers. The SWRC is also hosting its regular, monthly Electronics Recycling Collection with Vintage Tech Recyclers. Both events will take place at shelby Township Hall at 52700 Van Dyke Ave. 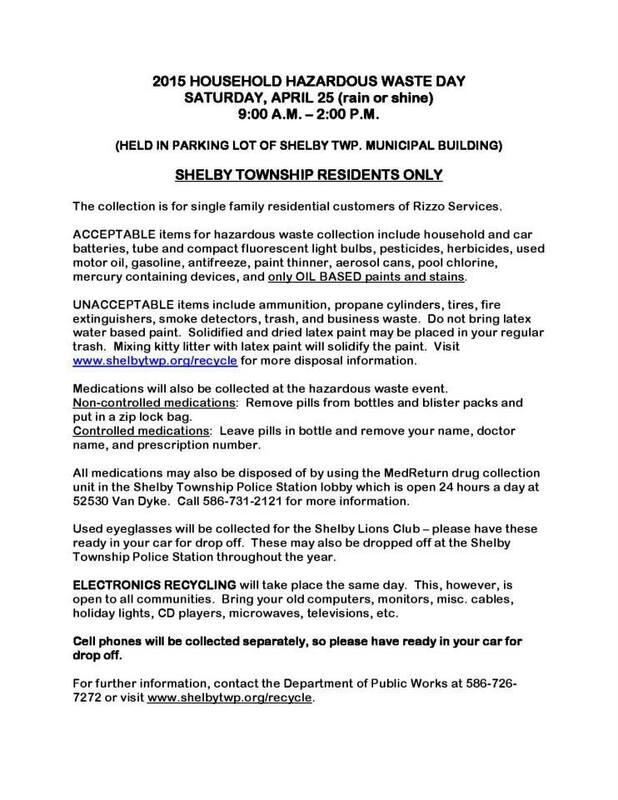 The Beautification Committee is hosting its annual Clean-up Day Event with check-in at 8:30 a.m. at the Shelby Township Community Center at 51670 Van Dyke Ave.
As if recycling did not pay dividends enough, the Shelby Township Board of Trustees and the Solid Waste and Recycling Committee found another way to make the world a better place with funds raised at the township’s monthly electronics recycling event. 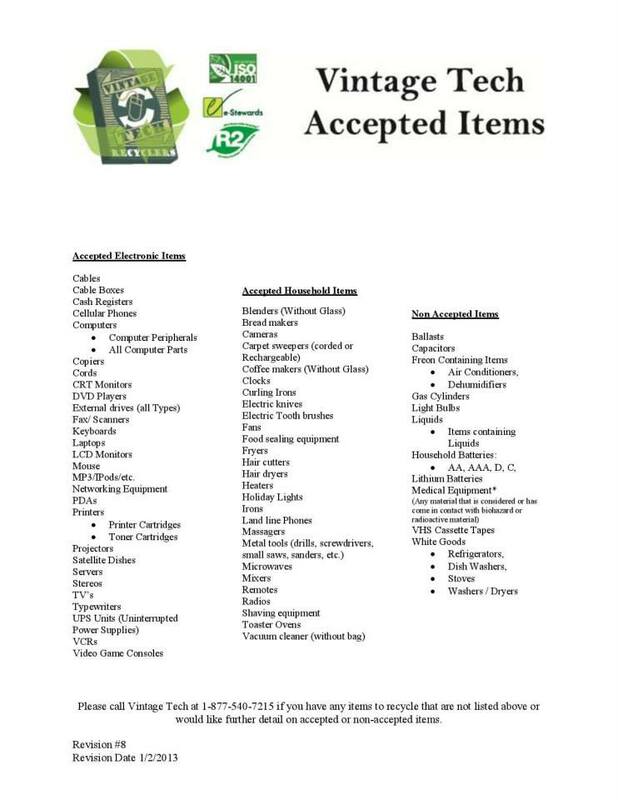 Through the township’s contract with Vintage Tech Recyclers, which runs the monthly collection of items, such as computers, DVD players and other electronics on the final Saturday of every month, the Solid Waste and Recycling Committee established the Community Give-Back Program in 2013. This program allows charitable and community organizations to earn funds by volunteering at the events or through a “community benefactor” grant. The first grant was awarded Dec. 16 as the Board of Trustees presented $10,000 to the Shelby Township Parks and Recreation Committee to be used for a new splash park at Chief Gene Shepherd Park. The program allows for two groups to benefit from each monthly collection with a “co-sponsoring organization” earning funds tied directly to that month’s collection earning 25 percent of the revenue received from that event, or $250 — whichever is greater. “Co-sponsoring organizations are able to participate in receiving some of the funds,” Filar said. “In order to be a co-sponsoring organization, organizations must be a 501(c)(3) service organization or public educational organization within Shelby Township. “It is required that 51 percent overall of the organization’s charitable efforts need to be spent on Shelby Township residents. And the organization must be run by non-paid volunteers, or a very low percentage of their revenue must be used to pay administrative costs,” Filar added. The second beneficiary is an annual “community benefactor” such as the Parks and Recreation Committee, whose 2014 grant came from a pool of revenue generated by the other 75 percent of the funds collected at monthly events. These benefactors must use funds within Shelby Township for environmental beautification or environmental quality projects with community benefactors. Based on collection totals from 2013 and 2014, co-sponsor charities have earned roughly $326 per month for a grand total of $6,845.50 while collecting 627,285 pounds of electronics for safe disposal, and $19,013.82 has been collected for the community benefactor fund. The free electronics recycling events take place at the Municipal Grounds, 52700 Van Dyke the last Saturday of each month from 9 a.m. to 1 p.m., except in December. This program is open to all communities. Computers and accessories, televisions, phones, microwaves and more are accepted. 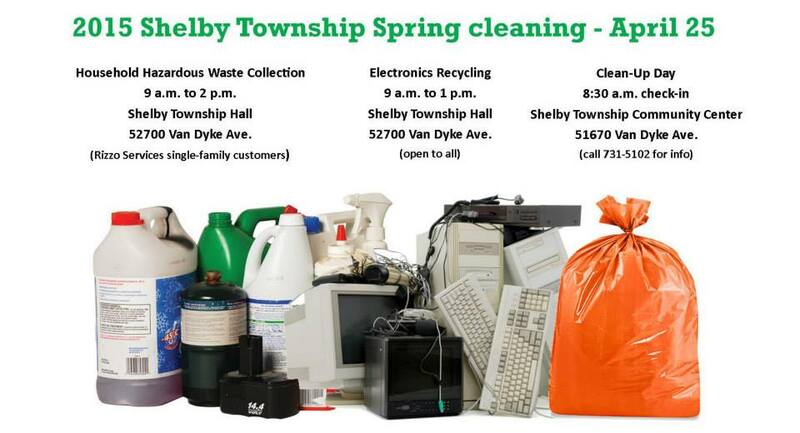 For more information about the electronics recycling events or SWARC, call the DPW at (586) 726-7272 or visit http://www.shelbytwp.org/recycle .